If You Were Me and Lived on….Mars is an enchanting imagined journey to the Red Planet. Carole P. Roman has written many colorful, fun, and educational books for children, including her popular If You Were Me…and Lived in series for grade-schoolers that explores life around the globe and throughout history. 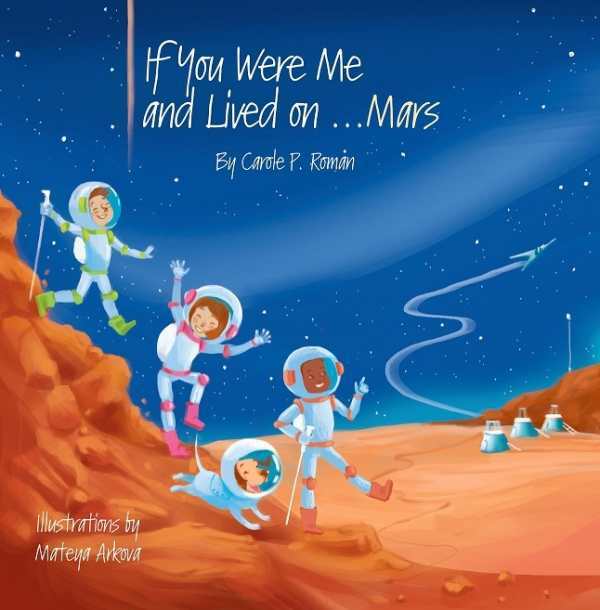 Now Roman is striking out for the stars with If You Were Me and Lived on…Mars, exploring how the children of Martian colonists might live in the future. While life on Mars remains the stuff of imagination, Roman underlines her story with plenty of science. Her trio of children and a pet dog impart lessons about Mars’s harsh surface conditions and temperature swings as they explore the dusty red planet in their space suits and helmets. They narrate their long space voyage and explain how they entertain themselves, how they grow their own fresh vegetables at their settlement (humorously: spinach does not grow well in the Earth/Mars soil mix, much to one narrator’s relief! ), how the lack of gravity affects their beloved basketball games, and other absorbing points. Though the tale is fictional, it contains enough factual information about astronomy to make it a good addition to the classroom science shelf. The glossary with its pronunciation guides also adds valuable educational content. A spiky, hard-to-read font on the back cover is the only point of distraction. Illustrator Marteya Arkova’s gorgeous artwork neatly captures this otherworldly adventure. Each page is a symphony of dusty orange Martian soil contrasted with a deep azure sky and smudgy atmosphere. Her Puckish children are enticing ambassadors for space travel and the further exploration of scientific topics.